In search of high R-multiples while keeping losses small. "Money Flow Ts are probably the greatest new thing I have seen in 20 years in terms of time symmetries." December 5, 2010. Please join us on Saturday, September 17, 2011 for an Investment Seminar featuring Terry Laundry. The seminar will be held at 3 Thurstons Court, Nantucket Island, MA 02554. The seminar will focus on the stock market “mystery cycle” and how to exploit it, Money Flow Ts™, bonds and precious metals. We will present the material in a format that is easy to understand. No specialized knowledge of T Theory™ is required to enjoy the full benefits of the seminar lessons. The seminar will start at 9:30 am and will conclude at 4:45 pm, with lunch and coffee breaks. For those staying Saturday night, there will be a workshop the morning of Sunday, September 18 ending by 11:00 am. For those arriving Friday night, there will be a reception. The Early Bird price is $450. Early Bird payments must be received by August 1, 2011. The normal price is $495. Refunds must be requested by September 1, 2011. To pay by check, please make the check payable to “T Theory™ Foundation, Inc.” and mail to same at 3 Thurstons Court, Nantucket, MA 02554. Each day, Terry Laundry posts a market update on his Stockcharts Public Chartlist. We have created a Twitter account called TTheorydotcom which will tweet these updates to the free world for those who wish to follow. We are proud to announce the new T Theory Forum, the official members-only discussion blog for T Theory. The Forum is provided free for American Shareholder clients (for as long as they remain clients) and our September seminar attendees (for one year). If you are one of these kind folks, please contact Paula Burke at Paula@TTheory.com for instructions on how to join the forum. Basically, it involves creating a free Wordpress account. We will simply need to know the e-mail address associated with your Wordpress account. In addition, if you purchase another T Theory product, you will be invited for a free one-month or three-month trial of the Forum. For others, the cost of the Forum will be modest: $29/quarter or $99/year. Paid forum members will receive a discount on other T Theory Products. 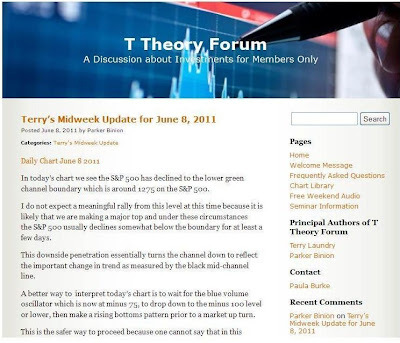 The T Theory Forum will be the exclusive home for Terry Laundry's legendary daily chart with his famous adaptive channels and volume oscillator plot. Terry provides mid-week and weekend updates to the chart with commentary. My job will be to moderate the Forum on a day to day basis. We will strive to post new content nearly every day. 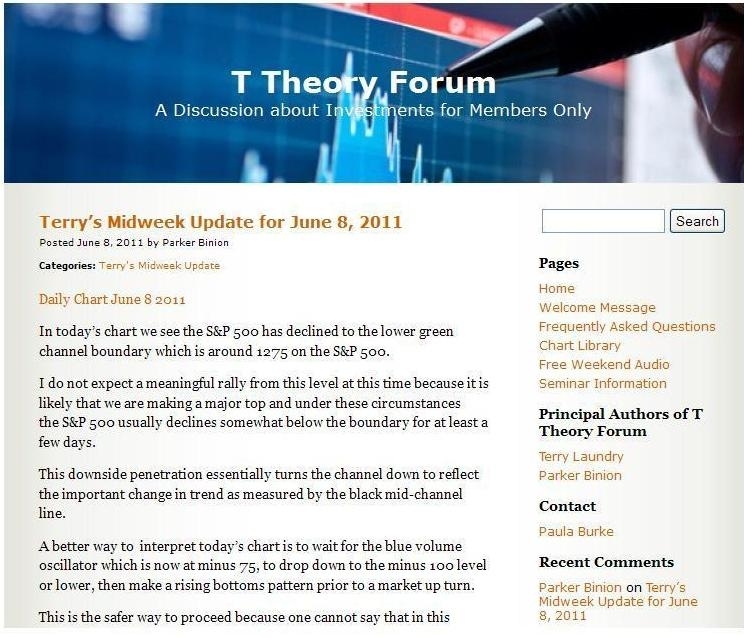 We hope to make T Theory Forum your interactive community of choice for investment discussion! Please feel free to ask any questions here. By trade, I am a successful trial lawyer. I managed my own investments, loved it, and now trade for a living. We seem to be cutting a diamond formation on the S&P. If so, the minimum downside target is 50 points from where price breaks down. Trade at your own discretion. I am a lawyer, not a registered investment advisor. While I may have a financial interest in one or more of the securities discussed in this Blog, my objective in writing this Blog is not to offer specific predictions or forecasts for the markets or particular securities, but to interest readers and encourage them to conduct their own further diligent research. Neither the information nor the opinions expressed should be construed as a solicitation to buy or sell any stock, option, ETF, mutual fund, currency or commodity. Past performance is not necessarily indicative of future results. You may lose money trading and investing. I don't share in your profits, so I don't share in your losses. Investors should obtain the advice of a qualified investment advisor before entering into any transactions.